At the beginning of 2019, The Philly Soccer Page asked for your help. 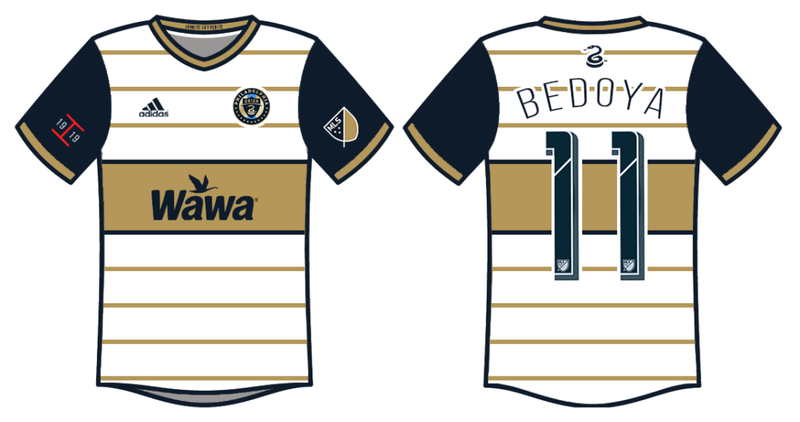 Inspired by the team’s 10th season, we wanted to see if our readers might take a stab at designing the squad’s next jersey. The entries were outstanding, creative, above and beyond what even the most optimistic person on this site (certainly the author) might have envisioned. If you missed this contest, check out the entries here. Though every entry had its merits, here are the two finalists and the winner. Finalist 1: Well-crafted, with local flair – Phil A. To coincide with last season’s new home jerseys, I added horizontal hoops to the jersey. I chose gold hoops and kept the blue sleeves to incorporate a better color contrast than just a white jersey. On the arm I added a patch commemorating the 100th anniversary of Bethlehem Steel’s 1919 Open Cup final victory. Maybe it’ll inspire the Union to finally win the cup! Lastly, I pretended to play owner and mercifully retired the Bimbo sponsorship logo. I replaced Bimbo with Wawa as the new sponsor. A guy can dream, can’t he? 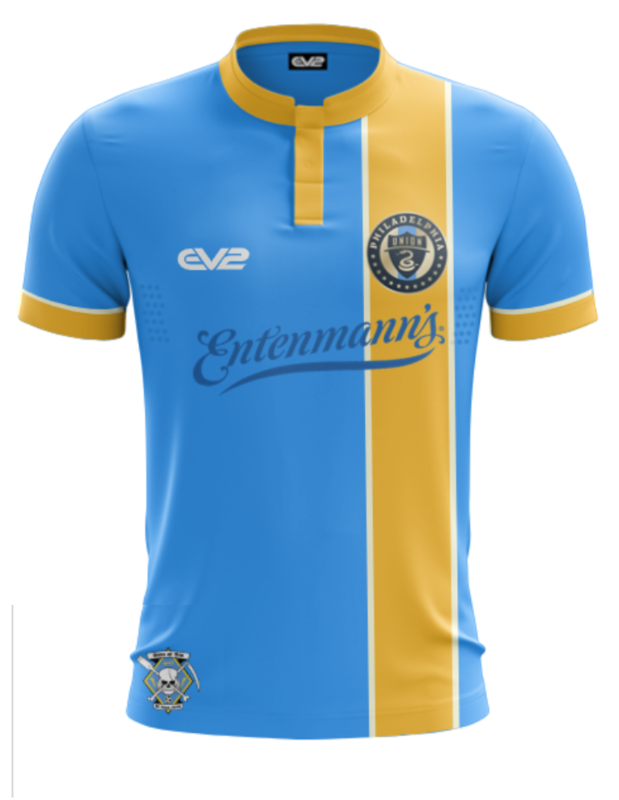 Finalist 2: Getting back to how we got here – Stef S.
I went with the colors of the city of Philadelphia to celebrate the city and our 10th season as the city’s MLS team. 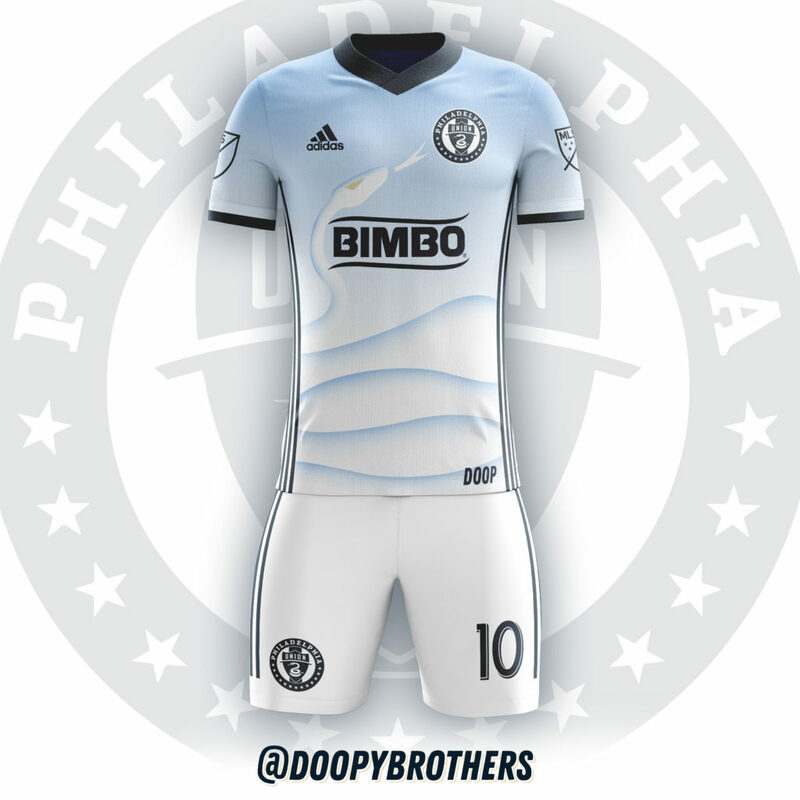 I brought back the “stripe” down the front since it was part of our signature look before the Doop Hoops. Not a fan of the Bimbo logo, I went with one of the their regional brands that blends with the kit better and will not deter as many people from buying one. Finally, I added the Sons of Ben logo to the bottom to celebrate and pay homage to the supporters group that helped get us here (and also help boost sales of the kit to the group). THE WINNER: The snake – Luke M.
The thought of my design was to show the snake wrapping around the jersey and facing the crest on the jersey in a way that isn’t super cheesy using the secondary blue to define its shape. The winner of this contest will have the opportunity to go to Chester, sit with the Union’s design team, and co-create a piece to be a part of the team’s 10th Anniversary collection of clothing. We’re looking forward to what Luke and the folks at Union HQ come up with. 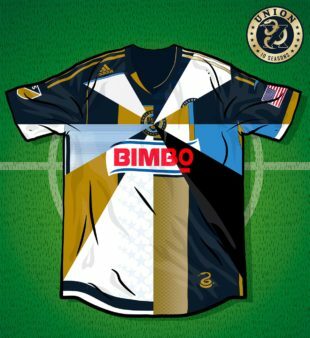 Beyond that, the Union have agreed to give part of the proceeds of the sale of this one-of-a-kind shirt to The Will Trippley Foundation. If you’re not familiar with this great charity, check them out. They support local soccer in Chester in a big and meaningful way. I just looked over the entries (I don’t know how I missed this the first time around) and I am pretty sure I would have disowned all of you if The Snake didn’t win! That is *$%^&@*% awesome!!! Awesome job by everyone. MLS would do well to consult with most of you for the next round of designs! Great choice. Nice to see that the Union stepped in! Love the winning kit ! Amazing work and an excellent choice for the winner. Congrats! Can’t wait to buy something after you design it! I remember early on the U did a fan design t shirt…I still have one in the rotation. Great job Luke. I’ll be adding yours to the rotation next! That’s pretty awesome! Well done to all of the talented designers and a big thanks to the Union for getting involved. Its not that I dislike the current jerseys, but honestly ANY of these 3 are a definite step up. Incredible work. Congrats to all! Man I want that winning jersey! Nice work! When Chris first proposed this idea, I kind of nodded and smiled. I didn’t pay much attention to it at first. Bottom line: These were awesome. Thank you to everyone who took part.